Helmets are an essential part of your child's safety gear when he goes out to play, whether he is riding a bike or scooter, playing football, or just skating. Unfortunately, many kids don't wear helmets. And those that do may not be wearing them properly. Whatever the reason, not wearing a helmet properly can put kids at risk of serious injuries, as we can see in reports of an increase in traumatic brain injuries (TBI) over the last ten years. Helmets aren't all the same. There are helmets for bicycling, ATV riding, horseback riding, skiing, and playing baseball, football, hockey, and lacrosse, etc. Each helmet is designed to best protect your child's head for the type of impact that he might have from that particular activity so that most, or all, of the energy from an impact is absorbed by the helmet. If your child is wearing the wrong helmet, then he won't be fully protected during an activity if he falls or gets hit in the head. In addition to choosing the correct helmet, it is important to make sure your child's helmet fits correctly. If your child's helmet doesn't fit, see if you make it fit better by adjusting the straps or applying any foam padding that came with the helmet. Of course, there are helmets for adults too and being a good role model and wearing a helmet can help to make sure that your kids do too. It might also help if movies for children did a better job of modeling safe behavior for children. Instead, many of the top grossing movies show characters who don't wear a helmet when riding a motorcycle or horse, etc. 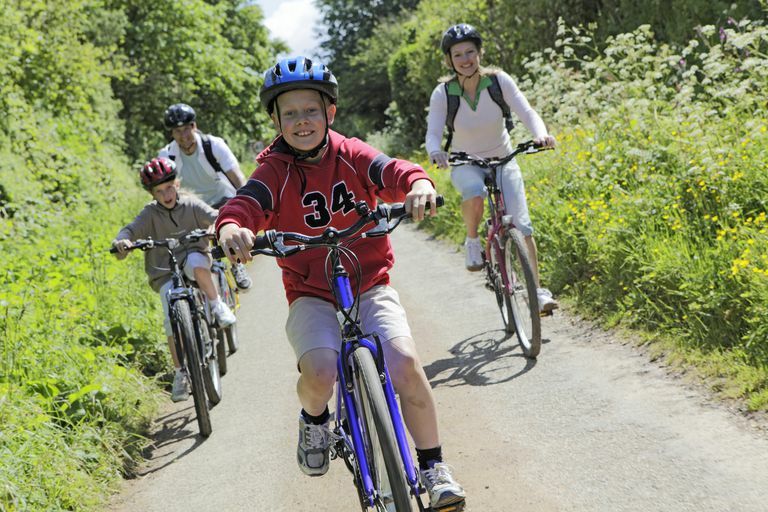 Each year, about 170 children and teens die in bicycle related injuries and another 300,000 are injured. That makes it important to get your kids to wear bicycle helmets every time they ride, especially since head injuries are the most common cause of death and serious injury in bicycle crashes. Many kids, especially teens, don't like to wear a helmet though. Often it is because their friends don't wear helmets, but since they do when they are involved in other activities, especially team sports, it is important to be firm about your rules for wearing a helmet. Bicycle helmet laws that mandate the use of bicycle helmets can also help to make sure that kids wear helmets and are protected when they ride. Unlike most other helmets, your child can wear his bicycle helmet for a few other activities, including recreational roller and inline skating and when riding a scooter at low speeds. Since 1999, there is a Consumer Product Safety Commission (CPSC) safety standard that bicycle helmet manufactures must follow. In addition to an American Society for Testing and Materials (ASTM) certification, make sure your child's bicycle helmet has a CPSC approval sticker. Despite using helmets, kids still have concussions when playing football. You still want your kids wearing a helmet with the latest technology though and which meets all of the requirements of the National Operating Committee on Standards for Athletic Equipment (NOCSAE), with a certification sticker that says it meet the NOCSAE standard, since the CPSC does not mandate safety guidelines for football helmets. Although you can also look at football helmet ratings, the NOCSAE cautions "against an over-reliance on any individual data point, rating or measurement which could lead to inaccurate conclusions or even a false sense of security that one helmet brand or model guarantees a measurably higher level of concussion protection than another for a particular athlete." Most importantly, in addition to meeting the latest NOCSAE standards, make sure the football helmet fits well, is being worn properly every time your child plays or practices, and has been reconditioned if it is more than a few years old. Although there isn't a specific helmet for ice skating, because there are a lot of head injuries among ice skaters, even recreational ice skaters, many safety experts recommend that they wear a bicycle, skateboard, or ski helmet. As with car seats, you should usually throw away a helmet that has been involved in a crash and replace helmets that are more than five years old. Helmets can protect kids against traumatic brain injuries. The trick sometimes is getting kids to wear them, wear the correct helmet, and wear the helmet properly. American Academy of Pediatrics Clinical Report. Sport-Related Concussion in Children and Adolescents. PEDIATRICS Vol. 126 No. 3 September 2010, pp. 597-615. CDC. Nonfatal Traumatic Brain Injuries Related to Sports and Recreation Activities Among Persons Aged ≤19 Years—United States, 2001-2009. MMWR. Khambalia, Amina. Peer and Adult Companion Helmet Use Is Associated With Bicycle Helmet Use by Children. Pediatrics 2005; 116:4 939-942. Wesson, David E. Trends in Pediatric and Adult Bicycling Deaths Before and After Passage of a Bicycle Helmet Law. Pediatrics September 2008; 122:3 605-610.